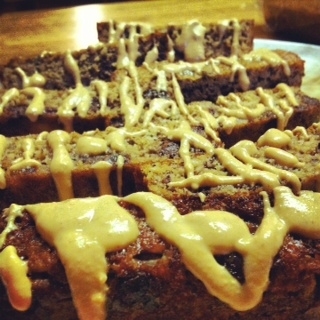 A healthy and delicious twist on classic banana bread! A blend of bananas, dark chocolate chips and peanut flour make this bread delicious for breakfast or a snack! It's low carb and high protein too, so there really is no guilt! 3. Put oats in a food processor and blend until they have turned into a flour. 4. In a second mixing bowl, mix dry ingredients together with a whisk. 5. Slowly add dry ingredients to wet ingredients and beat as you combine. 6. Add vanilla and chocolate chips, combine well. *I use ON french vanilla creme whey, but you can substitute any kind of whey you'd like! **This recipe says it makes 16 servings because I baked two separate loaves so I would have smaller pieces, but by all means bake it into one loaf and get 8 very nice sized slices! Just be sure to double the macro and caloric values indicated here for accuracy.